As of August 5, 2014, our Requirements, Terms of Service, Pricing and Submission Form have changed. Please visit these pages to view our new policies. For free and bargain book submissions please submit your books that will be promoted after the following dates: free books – August 12th, bargain books – August 18th. Thank you. Many of you have asked if there’s a way to support ENT for the free books that we post for you so here’s a PayPal donation button for those of you who may be interested in helping out. Since we do not guarantee that your book will be posted by filling out the form above, please do NOT make a donation until after you are sure that your book has been posted. Click here to see the latest free and bargain books. Visit Ereader News Today's profile on Pinterest. 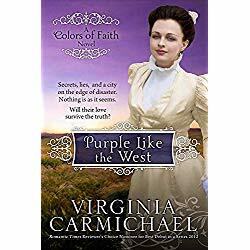 Christian Fiction novel by Virginia Carmichael is available for only $0.99 ~ save $2! Margaret Gilbert, a railroad executive’s daughter, is a pampered princess of San Francisco’s wealthy elite. She chafes under the expectation that she will marry for status and dreams of independence. When she joins the local Ladies’ Aid Society, she’s horrified by the treatment of the Chinese immigrant laborers. Vowing to expose the abuse, she begins to investigate the complicated system of slave labor provided to the railroads, but no one will listen to a woman like her. When she meets Ezra Pendleton, heir to a newspaper empire, she concocts a plan to tell the world- without incurring the wrath of her father. Ezra is the perfect cover. She’ll make her family happy by feigning interest in a very eligible bachelor, become an undercover reporter, and keep her identity a secret. At least, that was the idea. Margaret starts to wonder if Ezra will turn out to be her plan’s fatal flaw. He is not the sort of man you can string along with flattery. He’s smart, wary, and is hiding a secret of his own. As the city falters under the stress of the Chinese mobs, the situation turns more dangerous than they could have imagined. Racial tensions in the city hit a breaking point and arson strikes close to home. By the time there is an outbreak of the plague in Chinatown, it seems as if all the darkest parts of the city will be revealed at once. Margaret and Ezra are thrown together in a common cause, but will their secrets destroy the love that is growing between them? A story of faith, honor, and forgiveness. Authors, submit your bargain and free books to ENT here. Authors, submit your books for the ENT Book of the Day here. No content on this site may be reused in any fashion without written permission from EreaderNewsToday.com. EreaderNewsToday.com is a participant in the Amazon Services LLC Associates Program, an affiliate advertising program designed to provide a means for sites to earn advertising fees by advertising and linking to Amazon.com.